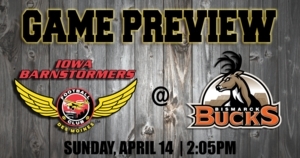 Des Moines, IA – The undefeated Iowa Barnstormers (5-0) are looking for their sixth straight victory when they travel to take on the Bismarck Bucks (0-5) this Sunday, April 14. Kickoff is set for 2:05 p.m. CST at the Bismarck Event Center. The Barnstormers are coming off back to back victories against the Cedar Rapids River Kings in the past two weeks. Most recently, Iowa beat Cedar Rapids 59-48 last week in Wells Fargo Arena. In a game that had many lead changes and crucial plays, perhaps none was bigger than when quarterback Daquan Neal threw a touchdown to receiver Ryan Balentine on fourth down to extend the lead to 10 points with under a minute left in the game. The Barnstormers defense also came up big when it was needed, forcing two interceptions. The Bucks have had a tough start to the season, as the squad is still looking for their first victory. The Bucks lost their last contest to the Sioux Falls Storm on April 6, 64-31. In the past couple games, the Bucks have used a tandem to run the show at the quarterback position. Quarterbacks Homer Causey and John Gibbs have both been given opportunities to lead the offense and present a tough challenge for the Barnstormers to prepare for. On defense, the Bucks are led by defensive back Joseph Blount Jr., who has recorded 19 tackles in the past two games. Under head coach Dixie Wooten, the Barnstormers are off to a hot start. The underdog Bucks will look to upset the defending league champions and kick-start their season this Sunday. Fans can tune into the game live on YouTube starting at 2:05 p.m. CST.